ARLINGTON, VA, October 3, 2013 – Today, PBS KIDS launched a collection of new online and mobile games and activities from its newest media property PEG + CAT. The collection includes a new app: the PEG + CAT Big Gig App for iPad, Kindle Fire and other Android devices, in addition to online games and offline activities that families can enjoy together.A new series for preschoolers, PEG + CAT premieres on PBS KIDS on October 7 (check local listings) and follows the adorable Peg and her sidekick Catas they embark on adventures, solve problems and learn foundational math concepts and skills. The zany quandaries that Peg and Cat face happen in a variety of different worlds – from a farm to a distant planet, from a pirate island to a prehistoric valley, and more. 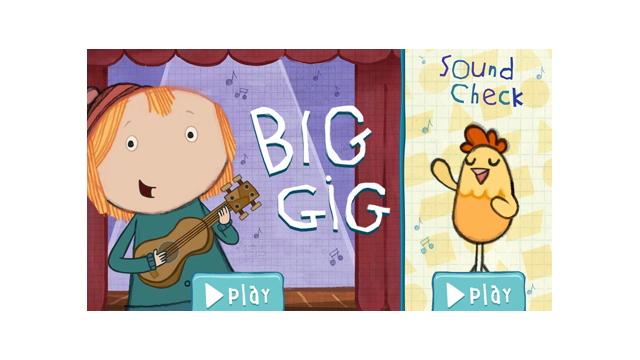 Designed for children ages 3 to 6, the PEG + CAT Big Gig App leverages the original music from PEG + CAT to help kids understand math concepts such as numbers, counting, patterns and more. The app includes two activities: Big Gig and Sound Check. The PEG + CAT Big Gig App is available from the App Store on iPad or at www.AppStore.com/PBSKIDS. The app is also available for Android tablets on the Amazon Appstore. Co-creators Billy Aronson (Rent, Postcards from Buster) and Jennifer Oxley (Little Bill, The Wonder Pets!) have teamed with The Fred Rogers Company to bring young viewers a new way to experience math through Peg and Cat’s relatable, and often hilarious, adventures. Each PEG + CAT episode features original songs and fascinating stories in which Peg and Cat encounter a problem that requires them to use math and problem-solving skills in order to move forward. The series will air daily on PBS KIDS following its premiere on October 7 (check local listings). For information and images from PEG + CAT and the PEG + CAT Big Gig App, visit PBS PressRoom.